(CNN) -- A top executive for the company which built the flight data recorder aboard Air France Flight 447 says he hopes his firm's 100 percent recovery record from air accidents will be maintained despite concerns the device may be lost at the bottom of the Atlantic Ocean. 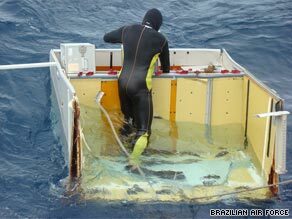 A Brazilian diver floats on wreckage of Flight 447 spotted Wednesday. Although some debris has been retrieved, air crash investigators remain in the dark about what caused the airliner to plunge into the sea off the coast of Brazil with 228 people onboard earlier this month. The wreckage is believed to be about 4,500 meters (15,000 feet) deep, amid underwater mountains and mixed in with tons of sea trash. A French nuclear submarine and other vessels are searching for the flight data recorder by attempting to trace its locator beacon, which sends acoustic pulses, or "pings," to searchers. The U.S. Navy has contributed two high-tech acoustic devices -- known as towed pinger locators -- which have been attached to French tug boats and can search to a maximum depth of 20,000 feet. Honeywell Aerospace's Paolo Carmassi -- the firm's president for Europe, the Middle East, Africa and India -- told CNN that retrieving the flight data could help solve the mystery of the plane's fate and said his company had never lost a black box involved in an accident. "We believe that our technology is well-positioned to, in this case, contribute to solve the big question around this particular accident," Carmassi said. But Carmassi acknowledged it was hard to estimate how much battery life the locator beacon had left. "There is a certain duration which depends on the particular environmental conditions, whether it's underwater or on land, whether it's at 10 meters or 4,000 meters. So, it's very difficult to pinpoint exactly the duration," he said. Yann Cochennec, an aviation expert with Air et Cosmos magazine, told CNN that a recorder had been retrieved from the seabed in 2004 after an Egyptian charter flight crashed into the Red Sea shortly after leaving Sharm el-Sheikh. But he said the depth of the Atlantic, strong currents and bad weather would make retrieving the recorder from the Air France wreckage far more difficult. The flight data recorder -- sometimes called a "black box" -- is actually an orange, metal cylinder weighing about 13 pounds. Inside is a stack of memory chips designed to survive high temperatures, strong impact and tons of pressure. The devices record virtually every detail about how an aircraft is working, including cabin pressure, speed and altitude, remaining fuel and whether that fuel is flowing properly. They have played a crucial part in air crash investigations since they were first fitted to commercial aircraft in the 1940s.